The most popular beach on Koh Lipe is Pattaya beach. Located on the South side of the island it offers a lively atmosphere with an abundance of accommodation, restaurants, bars and spas nearby. Being the closest beach to Walking Street, it is very busy during High Season as boats drop their passengers here to visit the immigration office located at its’ Southern end. Boasting the title of Koh Lipe’s longest beach, Pattaya is approximately 1.5 km long with powdery white sand and crystal clear turquoise waters. Pattaya offers opportunities to enjoy a snorkel or a swim during the day whilst answering the demand for nightlife after dark. Interestingly, should you be lucky enough to be on Pattaya beach during the evening, you are very likely to see the local Chao Ley off the shore catching crabs from their long-tail boats. The best hotels on Pattaya Beach, including luxury hotels, budget hotels, boutique hotels and resorts. Read the reviews and book with our partners Agoda and booking.com. Situated right on Pattaya Beach. 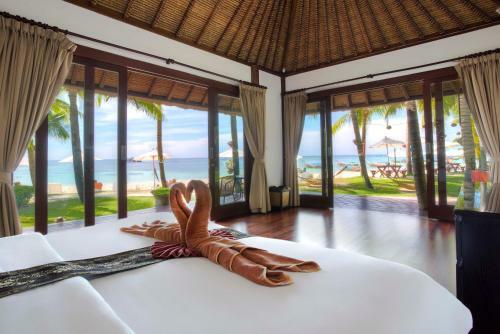 A luxury resort with Balinese style villas. Choice of sea view or garden view. A choice of deluxe rooms in a great location on Pattaya beach. One of the only resorts on Koh Lipe with a swimming pool. Great Location on the beach and only a few minutes stroll from Walking Street. A choice of luxury rooms. A popular choice on Pattaya Beach with a wide range of rooms to suit the needs of all travellers. A simple 2 minute walk from Pattaya Beach and only 5 minutes from Walking Street. The Breeze is a modern hotel offering a comfortable stay at an affordable price. A very popular choice on Pattaya Beach. A large choice of rooms suitable for all types of traveller. An affordable option right on Pattaya Beach. Clean and spacious rooms make Z-touch an ideal choice. Another affordable option on Pattaya Beach offering great value for money and a nice selection of rooms. Deluxe bungalow style rooms with a garden view and air-con. Situated in a central location on Pattaya Beach. Good Mood Resort is a 1 minute walk away from Pattaya Beach. Family loft rooms available to sleep 4. Basic bungalows set just a little back from Pattaya Beach. A choice of rooms available. One of the cheapest options on Pattaya Beach. Bamboo style bungalows are available.